Going through my collection the other night I came across these two cards of the Nautilus submarine from the 20,000 Leagues Under the Sea attraction that used to be at Walt Disney World. The most common card of this ride is shown here at right…that’s WDW-0070 (01110243)*. If you look around eBay, it is not uncommon to see multiple copies of this card available at any given time. It’s not a bad card, per se, but it’s just not as interesting as the newer card, WDW-0410 (0100-0243, also at right, below). 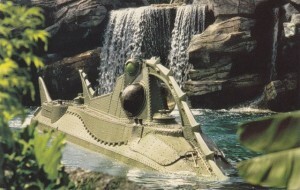 20,000 Leagues Under the Sea opened a couple of weeks after the opening of the Magic Kingdom itself. Despite a substantial crew of workers trying to get it ready for the October 1, 1971 opening of WDW, problems related to the lagoon prevented that from happening. Nevertheless, these 40 ton boats ended up serving in the lagoon for almost 23 years before the ride was ultimately closed in September of 1994. At the end of the run, low passenger loading rates and upkeep on the ride spelled its demise, despite its popularity. You can read more on Wikipedia. The beauty of the Harper Goff inspired, George McGinnis design is on full display in the later postcard. With the surrounding vegetation and lagoon, you really feel as if you are getting a secret glimpse of this mysterious ship. Almost 200 records have been entered into the database in the last few days! (Thanks Dianne!) Total entries are 824…and I am slowly loading photos. I don’t have a complete set of cards (does anyone??) so if you are interested in helping fill in any section with scans (for any park)…please let me know! I am still aiming to get all the NT cards in by end July, hopefully sooner. After that, I will move on to WDW postcards. I only have about 50 Euro Disney/Disneyland Paris postcards, so I continue to look for an “expert” on these cards as well…if you have an tips, please let me know. * The WDW numbering is consistant with Roger Le Roque and Nick Farago’s 1982 Disneyland and Walt Disney World Postcard checklist guide supplement. 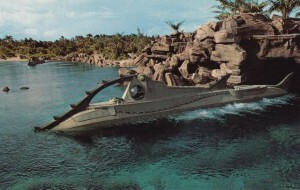 This entry was posted in Disney, Disney Postcards, Disney World, Disney World Postcards and tagged 20000 Leagues Under the Sea, Magic Kingdom, Nautilus, Walt Disney World, WDW. Bookmark the permalink.